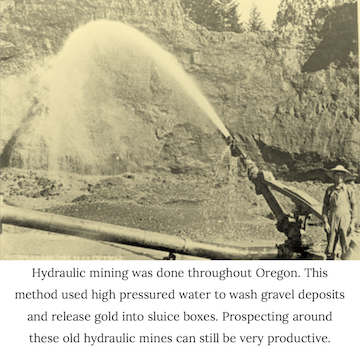 Oregon has fantastic opportunities for gold prospecting. The vast majority of the gold production in this state has come from two regions; the Eastern Oregon gold best that covers the Northeast part of the state, and gold bearing region of Southwest Oregon above the California border. Significant amounts of public land provide ample opportunities for gold mining in both areas. Placer gold discoveries occurred in Southwest Oregon in 1851 when rich gold deposits were found at Josephine Creek and other nearby creeks. Soon additional gold deposits were found at the Illinois, Applegate, and Rogue Rivers, bringing hoards of miners from California and the Willamette Valley of Oregon. Not long after the initial discoveries at Josephine Creek, rich gold deposits were found on the beaches at present day Gold Beach. Within weeks, thousands of gold prospectors were searching for gold in southwest Oregon. The primary areas worth prospecting are in Josephine County, Jackson County, the southern end of Douglas County, and parts of Curry and Coos Counties. Areas around Grants Pass and Medford have been major gold producers in the past. Gold here is found in both lode and placer deposits throughout the Siskiyou Mountains. In Douglas County, check out the areas around Myrtle and Cow creek. Quines and Last Chance Creeks, along with the South Umpqua River and all waters that drain into it have been producers. Both placers and lodes have been worked here, along with numerous hydraulic operations. Jackson County is a great area to prospect. Well over ½ million ounces of gold have come from this county since its initial discovery in 1852. Check out the Applegate River, along with Sterling, Palmer, Willow, and Elk Creeks. Gold can be found in all waters in this area. Josephine County has produced plenty of gold in the past. Check out the Illinois River and Josephine Creek, along with Galice and also Althouse Creek. Basically all creeks in this county have the potential for gold. Check for old placers, hydraulic pits, and lode mines. Curry and Coos Counties also have plenty of gold. Mining on the Sixes River will yield gold, and the Oregon beaches in this area also yield very fine gold. Look for black sand deposits. Eastern Oregon was the other major gold producer in Oregon, with nearly 2/3 of the total production coming from a few counties in the northeastern section. A gold belt covers an area roughly 100 miles long and 50 miles wide, covering much of Baker, Grant, and Union Counties. 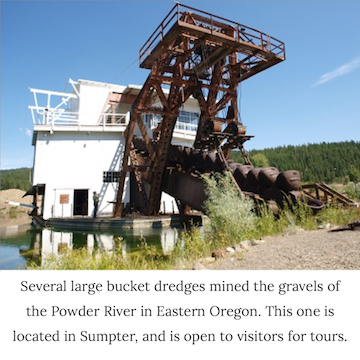 The area is covered with old gold mines, hydraulic and hand placer areas, and valleys churned up by bucket line dredging. The eastern side of the gold belt starts along the Snake River next to the Idaho border. From the town of Huntington up to the base of the Wallowa Mountains, several mining districts contain gold. The Burnt River along Highway 84 has gold, and most major drainages that flow into it will too. Some of the lower elevation areas have limited water, so mining methods may be limited to early season when spring runoffs are at their peak. Further to the west, the Blue Mountains are a fantastic area for prospecting. The Powder River drainage upstream from the town of Baker has had extensive mining done since the early 1860’s. Bucket dredges worked the Sumpter Valley for several years, and churned up miles of valley floor. Gold can still be found in these old tailing piles. In fact, the old dredges were designed to discard larger material, so many large nuggets and specimens were lost. Other areas to check out include the old mining towns of Granite, Bourne, Greenhorn, and Susanville. 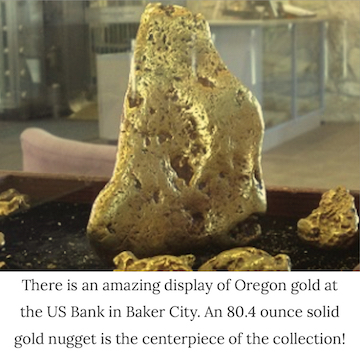 The famous Armstrong Nugget was found in Buck Gulch in Susanville. The gold belt continues westward toward John Day, Oregon. The John Day River and the headwater drainages are all worthy of exploration. The majority of creeks throughout this area will produce placer gold, and thousands of mines and prospects still have gold across Eastern Oregon.